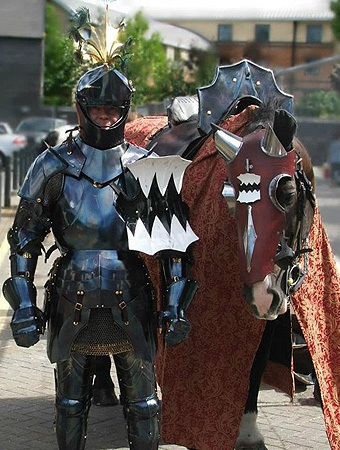 .Medieval armour suffers from numerous regrettable misconceptions, such as the idea that its wearer was barely able to move, defenceless once lying on the floor, or had to be winched onto the back of his horse by a crane. Responsible for these beliefs is an abundance of poorly crafted armour making it impossible to move properly, let alone ride, and a resulting lack of real practical understanding. Destrier's demands on a harness of armour are very high: On one hand the rider must be able to control his horse safely and without problems despite being encased in steel plate, on the other the harness must provide adequate protection against the opponent's splintering lance. 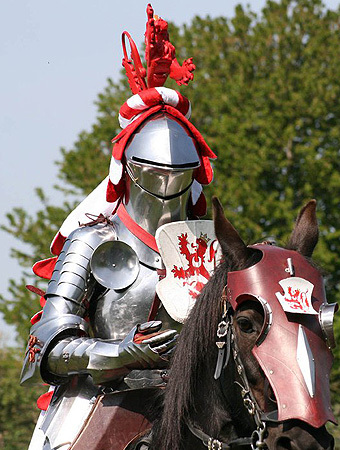 To resolve this apparent contradiction, an experienced armourer has to be commissioned who is familiar with the demands of a horseman's armour. Only his level of understanding enables correct interpretation of historic sources and the creation of a harness encumbering neither horse nor rider. 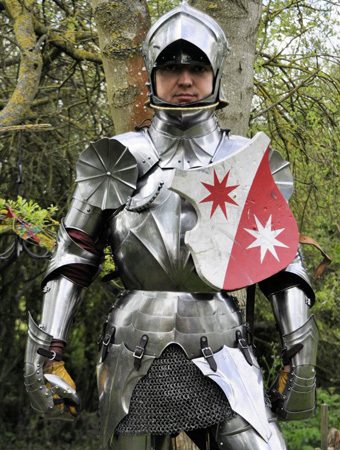 Not only the exact tailoring of the armour to its wearer is critical, but also the position of buckles, width of straps and the helmet's centre of gravity. In addition, a certain thickness and hardness of the material is necessary to achieve adequate protection in the joust. To fulfil all these requirements is a real financial challenge - most of the current Destrier harnesses represent replacement values between £15,000 and £25,000. 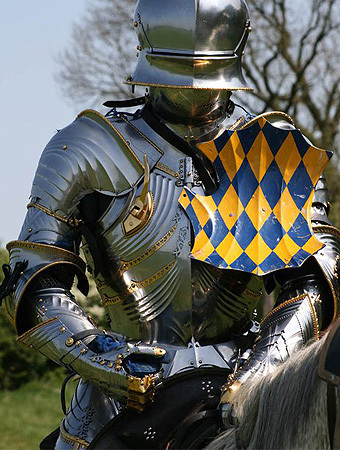 Often partly or wholly made from hardened and tempered spring steel with medium to high carbon content, the hardness of Destrier's armour comes close to late 15th century materials.